“June 2018 was the 20th anniversary of the clinical use of the first Tyrosine Kinase Inhibitor (TKI), Imatinib, in CML patients. Since then, the change in prognosis is one of the major success stories of modern cancer medicine”. Having this as an introduction of the CML section in this year’s education book of the ASH reminded me how far we’ve come in the past 20 years. Two decades have passed since first CML patients tested STI571, now called Imatinib, on initiative by CML experts Brian Druker and John Goldman against much resistance of established experts who thought this whole TKI approach is never going to work. Today, as long as they can access current CML treatments, patients and doctors are no longer concerned with delaying the inevitable progression of the disease or the time towards bone marrow transplant, as it was in 2001. Today’s focus on the best choice of therapy based on the individual molecular biology of the disease, as well as individual comorbidities, side effects, quality of life. The main treatment goals are mainly to reduce disease burden quickly to prevent risk of early progression, and then achieve deep molecular remission and good quality of life. For about one fourth of patients, therapy-free remission after years of treatment is already an attainable goal. 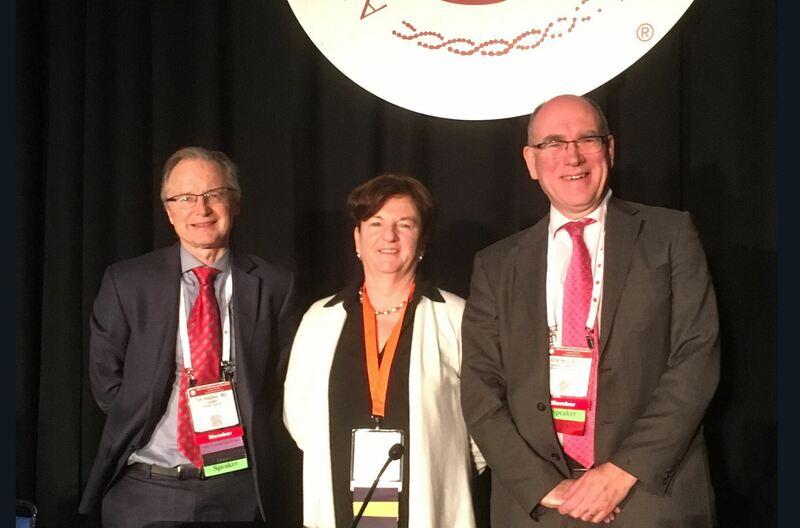 “With great success comes great responsibility” was the motto of this year’s CML Education Session at ASH 2018 – reflecting that with all the choice we have, we must do our best to leverage all therapeutic options to give each patient the best care possible, to live up to the promise that any CML patient can live a normal, long and good life. The three speakers, Prof Jane Apperley from the Hammersmith Hospital in London, Prof Tim Hughes from Adelaide and Prof Charles Craddock from the University of Birmingham made this very practical by outlining therapeutic decision making on two hypothetical cases: 55 year old overweight, smoking Bob with additional chromosomal abnormalities, and 22 year old Sue who was pregnant. The three CML experts touched upon three important areas: choice of first-line treatment, molecular monitoring schedules, and advances in stem cell transplant for patients where TKIs have failed. Jane Apperley highlighted that achieving major molecular response (MMR) is no longer the major therapeutic goal. 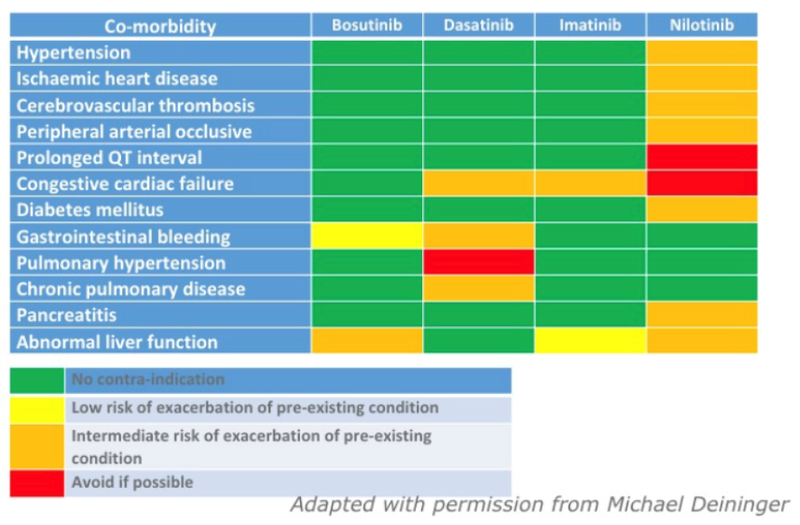 Getting patients into deep molecular response minimizes the risk of disease recurrence (according to the UK Destiny study), as there have been no reported cases of recurrence in MR4, except in patients with poor therapy adherence, or dose reductions due to intolerance of side effects. She said, if we all agree on deep molecular response being the goal of therapy, which first-line therapy should then be chosen? In summary of the first-line studies with imatinib, dasatinib, nilotinib and bosutinib, CML-related survival rates and probabilities to achieve deep molecular response were very similar, while the commonest cause of death in CML is actually not progression of disease, but death from comorbidities. Knowing that the drugs have different side effect profiles, with the elevated cardiovascular risks of nilotinib, one third of patients developing pulmonary effusions on dasatinib, as a slightly higher risk of early progressions on imatinib, Jane Apperley reminded the audience of the difficult balance to achieve the least harm to patients, weighing up lower adverse events and lower costs of imatinib against reduced progression rates, deeper remissions and potential higher chances for treatment-free remission on 2nd generation TKI. Lower age (children and young adults frequently have slower responses to TKI at 3 months on first-line treatment, higher white counts and larger spleens than elderly patients) – and the wish for family planning which may justify a need for quicker response and earlier treatment-free remission. Molecular monitoring in CML: How deep, how often, and how should it influence therapy? Tim Hughes complemented this with a presentation on how deep, how often molecular monitoring should be conducted and how testing should influence therapy. 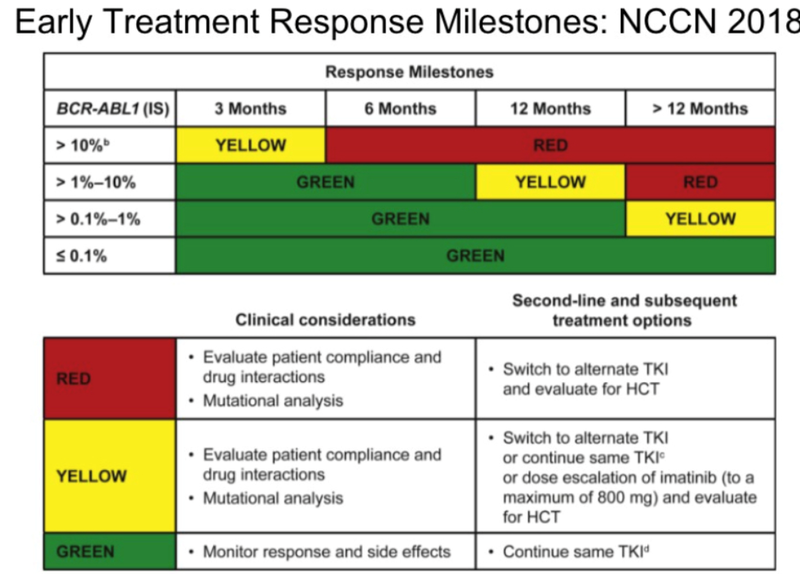 To illustrate this, Tim highlighted the treatment milestones as defined in the most up to date CML treatment guidelines from NCCN and ESMO. In terms of PCR monitoring frequency, Tim suggested 3-monthly monitoring except in unstable settings. These may include if there is a slow response (e.g. BCR-ABL remaining above 10%), when BCR-ABL rises above 0.1%, after patients try treatment-free remission in deep molecular response, or when restarting treatment after an unsuccessful attempt to stop treatment in deep remission. We do still transplant CML, don’t we? Charles Craddock from the University of Birmingham, UK, took a different angle and reminded that despite all enthusiasm on TKIs achieving excellent long-term outcomes in the majority of CML patients, stem cell transplantation is still the most important option for those failing TKI therapy even today. improvements in donor selection (with now 30 million volunteers registered in international donor registries, plus cord blood donors), in supportive care and in prophylaxis against Graft-Versus-Host reactions has reduced transplant-related mortality significantly. reduced intensity conditioning regiments now also allow transplantation of older fit adults, but this also brings a higher risk of disease relapse, which requires new preventive approaches. potential graft versus leukemia effects is leveraged in patients transplanted in first chronic phase. Donor lymphocyte infusion (DLI) is an effective salvage therapy in those patients, but effects of DLI are only modest when applied in patients in advanced disease phases. While identification of patients who can tolerate transplant has improved, disease relapse still remains the major cause of treatment failure, so different strategies to improve transplant outcome must be tailored, requiring more sophistication in conducting transplants with individually tailored treatment regimens. The additional application of donor lymphocyte infusions delivers durable molecular remissions in 30-90% of patients transplanted in first chronic phase, with graft-versus-host complications being lower when DLI is being applied 12 months after transplant or later. Providing TKI therapy after transplant can deliver a complete molecular response in up to 60% of CML patients who relapse – again this is most effective when transplanted in first chronic phase. For those transplanted in an advanced phase of CML, the Graft-versus-Leukemia effect seems negligible, and TKI monotherapy then fails to deliver durable responses in most patients. Outcomes in CML patients with active blast phase are still very poor. On TKI alone, five-year survival is around 10%, while TKIs in combination with allogeneic transplant have increased survival to around 47%. Hence, the treatment strategy in blast phase is to bring the patient back to a 2nd chronic phase in order to be able to deliver a curative transplant then. In myeloid blast crisis, combined TKI and induction chemotherapy is suggested, with choice of TKI guided by mutational tests. In lymphoid blast crisis, a HyperCVAD regimen plus imatinib or dasatinib may be recommended. As about 30-70% of patients experience a relapse of CML after allogeneic transplant, Craddock suggested that 3-monthly PCR monitoring should be mandatory in the first 3 years after the transplant. Apply an effective salvage therapy with donor lymphocyte infusions and TKIs. To download this report as a pdf file, please click HERE.